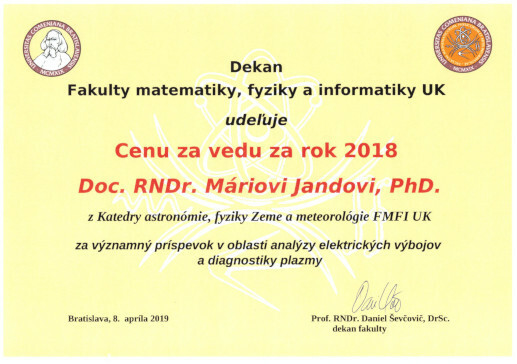 Division of Environmental Physics represents a part of the Department of Astronomy, Physics of the Earth and Meteorology at Faculty of mathematics, physics and computer science, Comenius University Bratislava. The interests and scientific research of our work group includes basic study of plasma physics and physics of electrical discharges, their utilization on various bio-medical applications (bio-decontamination of water and surfaces, ...), and treatment of gaseous and liquid pollutants. Besides, we also deal with other, non-plasmatic, technologies for utilization of organic waste, depollution of exhaust gases, and alternative sources of energy (hydrogen, wind and solar). As a consequence of experiments of exhaust gas treatment by electric discharges, we also work in the field of the theory of origins of life on Earth. We study possibilities of the formation of organic compounds from inorganic gases (carbon dioxide, nitrogen, water) by action of electric discharges. Members of our division participate also in the education process at our faculty. We are involved in several study programs: environmental physics, bio-physics, optics and plasma physics. April 2019: Our colleague Assoc. Prof. Mario Janda, PhD. 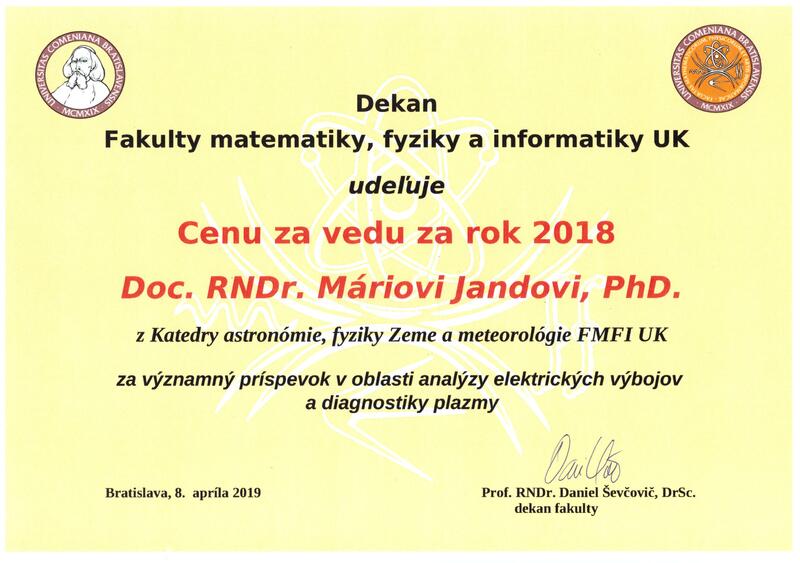 was awarded by Prize of Dean of Faculty of mathematics, physics and Informatics, Comenius University in Bratislava for scientific achievements for the year 2018. Description of the illustration image (from left to right): bio-decontamination of water by transientspark discharge, thermal degradation of organic waste, discharge in capillary tubes.